Tampa Bay Buccaneers QB Jameis Winston looked sharp on two drives at quarterback for the visiting Bucs, while QB Jeff Driskel led the Cincinnati Bengals in rushing yards — not rookie RB Joe Mixon. The Bucs and Bengals used a bevy of players on offense in their preseason debuts, including Pro Bowl wide receivers Mike Evans and A.J. Green each making plays early. 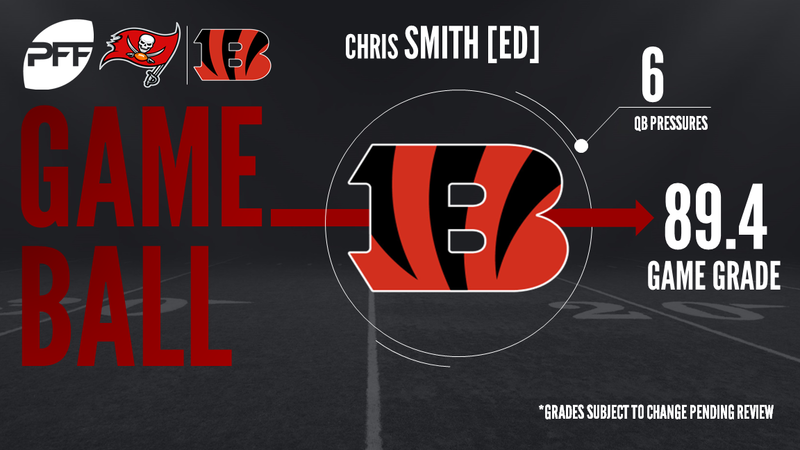 The Bengals emerged victorious, 23-12, and with that, we refocus and give you our PFF exclusive takeaways from the contest for each team. Erickson posted the highest grade for a Bengals offensive player with an overall grade of 77.0. Erickson had three catches on four targets with no drops for 49 yards, altogether fielding a 115.6 passer rating when targeted. Driskel gave the Bengals offense a spark, completing 8-of-9 pass attempts for 97 yards and a touchdown. Driskel averaged 10.78 yards per attempt. He also impressed using his legs running the Bengals read option scheme to great success against the Bucs defense, adding 34 grounds yards and a score on 5 carries. Chris Smith (89.9 overall grade), Jordan Willis (82.2 overall grade), and Carl Lawson (81.9 overall grade) looked sharp for the Bengals, and showcased their depth at edge pass-rusher. They took a huge step with the addition of Willis and Lawson in the draft and, with Smith, the trio dominated in the first week of the preseason. The combined for one sack, three hits, and six hurries as they gave the Buccaneers offensive line a major headache all game long. Lawson finished with a game-high, impressive 15.0 pass-rush productivity mark. Jackson, last year’s first-round pick, missed his whole rookie year due to injury. He showed that he is back healthy by playing 40 snaps and allowing just one reception catch on three targets for 12 yards and a passer rating of just 46.5 when targeted. After a season where Evans was the second-highest graded WR, the connection between him and Jameis Winston looked as strong as ever Friday, as he was targeted 7 times out of 12 routes run. Evans finished with 4.83 yards per route run in his preseason debut, good enough for second-highest so far this preseason of any WR with six or more targets. Most of the talk from the Buccaneers offense will be about the disappointing play of Ryan Fitzpatrick, and it’s possible that poor play has opened the door for Ryan Griffin to win the No. 2 job in Tampa Bay. Griffin looked good under pressure, completing 3-of-4 passes for 43 yards, and fielding a 109.4 passer rating under duress. McClain had a big day as he finished with three stops in run defense. In pass coverage, he also only yielded four yards on two pass targets. Hargreaves also turned in a nice performance for the Bucs defense, finishing with an overall grade of 80.9. Hargreaves yielded only two receptions on four passes thrown his way and also had a sweet interception, breaking on an out route at the goal line to stymie an early Bengal drive. He allowed a 24.0 passer rating into his coverage.